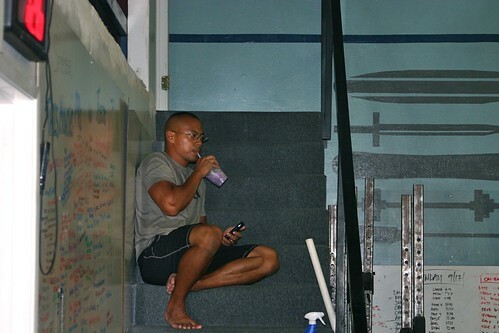 Home » WOD Blog » Ready for Rx’d? Notes: Keep in mind for those that attended Friday, your 1 RM Clean should be close to your 3rm Front Squat. Notes: This workout can be scaled in numerous ways. Bar MUs can be scaled with bands, jumping, or rings. A combination of C2B or Regular Pullups, and dips can be used as well. Conditioning Bias: 7 Burpee Pullups/ 100 meter run. I read an article a few days ago titled “are you ready for RX’d?”. Unfortunately the link I originally used to find it has expired. This article discussed how to approach the desire we all have for the Rx next to our name. Many of our benchmark workouts were originally intended for top-level athletes and without the prerequisite strength and technique there is huge potential for injury. A few box owners and trainers responded with their views. I was surprised to notice how frustrated I got with their answers, so I figured I should talk about it. I will try to keep my views brief. There was the typical “Its all subjective,” and although I agree with this to an extent, I don’t think this is a helpful response. This gives us no guidance on how to approach our workouts. If it is subjective, then based on what? How does it change from person to person? Otherwise it comes across as just repeating the concern of the question. Its like saying we realize that some people shouldn’t Rx, because we think not all people should Rx. There was a box that had a 50% rule and used Grace as an example to discuss it. If the Rx’d weight is more than 50% than your 1RM, you need to scale to keep it below 50%. This is for all workouts. So if I wanted to do Grace, I need to be capable of clean and jerking 190#s. That is ridiculous. If I can do Grace in less than 3min, why should I never train with weights in that range? What happened to: you need to lift heavy to be able to lift heavy. And how would I know what my 1RM is if I never lift heavy. I’m sure I’d be terrified to lift something more than double what I have ever lifted before too. So although I commend them for having a true guideline on which to run their gym, I just don’t see how that will develop athleticism. There also seemed to be a consistent view that you hurt yourself with weights, and only barbell movements need to be scaled, whereas you cannot hurt yourself with the bodyweight stuff. Everything can, and on occasion should, be scaled. To think either you can or you cannot perform a movement is a limited view. And just because you can do a movement doesn’t necessarily mean you should do it. Just because it doesn’t involve external weight does not mean that the potential for harm is diminished. Rudy, from Outlaw, has the view that if you are struggling, then put a twenty min time cap on the WOD, and you will spend 20mins attempting to do Rx’d. If it involves something like a Deadlift, then if you can lift that weight once, even if the WOD asks you to do it 30 times, you will just lift it once again and again for as many times as you can in 20min. Though this view has its function, it’s not a suitable view for everyone. What is comes down to is that the Rx’d version of the workout is a template for your training. In our box you are not in a competition scenario, you are in a training environment. So ask yourself whether you can do the workout as Rx’d, and then ask yourself whether it will benefit you to do so. Be true to what your goals are. If your standards will be compromised, you are not developing transferable strength. You might get a little RX next to your name on the whiteboard, but by the next day someone has done HSPU against your name and it will be gone. It will be a short-lived achievement. If you are working on maintaining range of motion, stay lighter. If you are preparing for a comp, scale the number of reps and try the heavy. So keep the longer-term in mind and use your trainers as a resource to consider how best to mold your workouts for your training goals.